I love that first one. Have a great weekend, Pam! I love the basket with the candles. There is nothing like a warm summer evening outside with candles everywhere. Well minus the bugs because they eat me alive. Inspiration time! I have a hanging planter I LOVE that will work beautifully with some moss and candles like she did. Thanks for sharing her gorgeous work! I love candles and just bought huge oversized hurricanes from Restoration Hardware, cannot wait to use them. Pam the hanging wire basket with candles is wonderful! The creativity blows me away! Love that wire candle "chandy"! 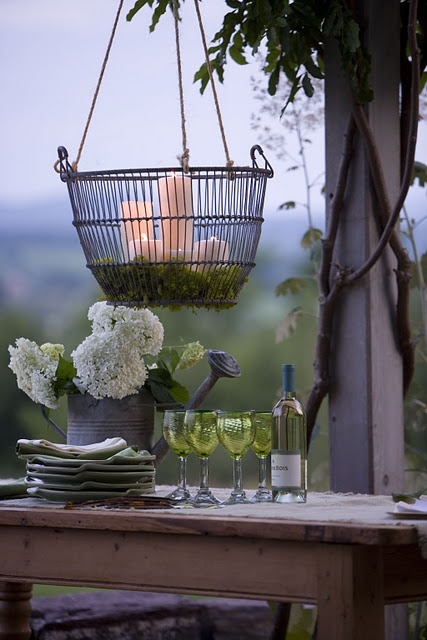 Love those ideas, and that basket with moss and candles! Hope your weekend is fun and relaxing. Thanks Pam, I have added her blog to my daily reads! I'll pop over and check it out! I like to use lanterns outside and (if you have trees) little hanging tea lights in containers. Have a great weekend Pam! You would be an amazing stylist, Pam! The way you put together vignettes???? How fun would that be! 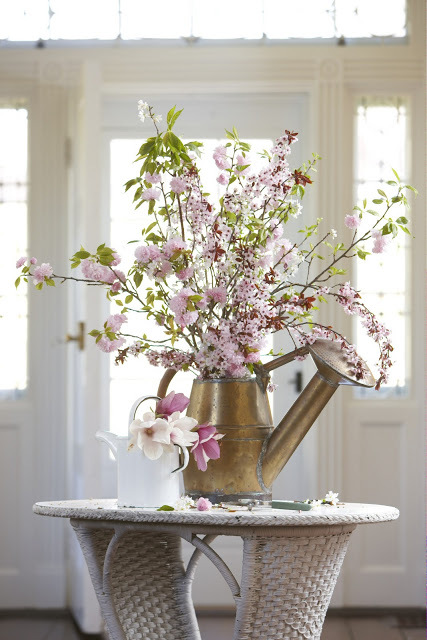 Such beautiful work- love the candle basket and the cherry blossoms. Thanks for sharing- such beautiful floral designs on her blog. You would make an amazing stylist, Pam! Your dream job that you'd rock at!!! Moss makes everything look better. It's so soft and cushy looking, I love the way it's used in that first pic. My blood pressure is going down just looking at these gorgeous photos. Weekend - yes! Hope you have a great one, Pam! love this idea and a great candle to get if anyone is afraid of real flames is the luminara wax candle,,it looks to real its unbelievable, it evens gives off a light lemon sent! Love the images!! Love this!...I have an antique egg basket that is similar to the chandy...it is giving me some great ideas...She certainly is amazingly talented...Thanks Pam...and have a great weekend. You're sharing useful information, LOVE this garden lighting decor! See also more and compare for best prices deals for Garden Lighting here!